I’ve suffered a great deal of trials and tribulations in my life, especially from the end of Junior High through High School. I lost my mother in 2004. Her death had a tremendous impact on me for the years to follow, even to this day. I was fortunate enough to have been told of the Creative Arts Team (CAT) Youth Theatre, a free theatre program for Junior High and High School students from all over NYC. I joined in 2006. In this program, I (and many others like me) was given the opportunity to gain experience and strengthen my acting skills in an environment of peers, who proved to be an odd, yet magnificent bunch. Life long connections have been made. Invaluable lessons have been learned. Most of all, I have gained a great sense of self, belonging, and social awareness from years of that free membership. I dropped out of High School when I was 17, for no other reason than my own ignorance and arrogance. The amazing thing is that although I knew in the back of my head I ought to attain a higher education and I was ruining my life, the Youth Theatre and its Director were never overbearing about my life choices. It was clear that the decision was frowned upon, yet they allowed me to learn that lesson intrinsically rather than force-feed it to me, like most others would. In The Shadows, performed in NYC and Liverpool, for the 2008 CTW Festival. 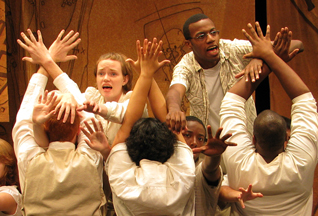 In 2008, I was selected to be a part of an ensemble made of members of the Youth Theatre, past and present, to devise yet another original show and tour it to the United Kingdom. Barely 18, I was given the opportunity to travel outside of the country and perform in Contacting The World, an international theatre festival comprised of youth theatre companies from all around the world!! It was one of the most remarkable experiences of my life and an adventure I’ll keep fresh in my memory forever. When I returned to the states I had a clear, unmovable direction: continue my education. I enrolled in CUNY Prep to get my GED. I enjoyed all the benefits of a high school – even prom. I never considered myself to be outspoken, opinionated, charismatic, delightful or even adequate until the Youth Theatre became my extended family. At that prom, I was crowned King! As I awaited the results of my GED scores, I faced a string of the toughest months of my life. My father grew terminally ill and passed. The Youth Theatre was there to keep me sane, grounded, active, expressive and alive as I was thrust into a position where I had to support myself. Of course I had the network of my family and friends to help me as well, but I honestly don’t think I could have survived were it not for that creative outlet. I was accepted into Lehman College, where I took on the challenge of attaining my Bachelor’s Degree in Theatre and Education, the two influential factors in my life. All the while I was still an active member of the Youth Theatre, only consistent thing in my life. It wasn’t long before I was offered a position as the temporary Assistant Administrator of the Youth Theatre. Soon the temporary position became a permanent one, and I branched into other programs offered at CAT. Now I’m Assistant Administrator of the Youth Theatre and an Actor/Teacher for the Creative Arts Team, teaching fourth and fifth graders as well as high school students. I can honestly say that my time and commitment to the Youth Theatre has allowed me to realize the joy of education from a completely different perspective. Although my active membership as a Youth Theatre participant expired a few years ago, I’m still very much invested in it. They say no one ever really leaves the Youth Theatre; they always stick around. It’s true. The Youth Theatre is an ever-growing, ever-pleasant community – a family. In 1993, after a decade or so of being a stage manager, scenic artist, director and producer in Boston, I had come to New York to get a Master’s degree that would prepare me to teach high school drama — acting, set design, directing the annual musical, etc. You understand: a “traditional” theater job. And then I took this class taught by Nancy Swortzell: “Drama in Education,” during which she led a session that left me wondering, “What on earth just happened?” and “How do I do that? Nancy set up the students in the class to enter into role — that is, not act, but take on the characteristics and sensibilities of highly skilled and respected artists of a large city. The time period was Egyptian-esuqe, and Nancy took on the role of the top Adviser to the city’s ruler. As the king’s Adviser, she told us, she had been charged with bringing the finest artists of the realm to the palace. We were all now entered into a competition: create a piece of art – a blazoned shield or royal coat of arms, if you will – that celebrated the magnificence and benevolence of the king. The winners would get fabulous prizes and they and their families would live free and easy for the rest of their lives. She then proceeded to outline in great detail the various deeds and achievements to be celebrated. Through her words and actions, it became clear that the ruler led with an iron fist. Some of the “artists” did grumble amongst themselves about being the king’s “puppets” and having their “artistic spirit” being so constrained. But any hint of bowing out of the competition or possible resistance, including “subversive messaging” through the art work, was quickly quelled by the Adviser’s subtle, and not so subtle, threats to family and friends living outside the palace walls. I recall working in small groups, poster board and magic markers in hand, earnestly creating these pieces of “art,” carefully crafting the message each symbol would send. As we worked, the Adviser would check in with each group, asking them to explain the reasoning and significance of their choices. As she moved amongst the artists, the Adviser offered suggestions and expressed approval or disapproval. Finally, all the groups were asked to stand up and prepare to share the results of their work. As we all awaited the “unveilings” and the Adviser’s decision on which pieces would be taken to the king, Nancy broke role and spoke as a narrator: “Time passed,” she said – and as she continued the narration, she walked to each piece of artwork and ripped it into small pieces. It was a visceral shock hearing the paper tear. Seeing what I – what we had created be so heartlessly destroyed. Nancy continued the narration, moving time forward to the present day. We were to stay in the same small groups, but now had a new role: that of esteemed archeologists who had uncovered intriguing artifacts at an ancient dig. Each group was given a collection of pieces – not our “original” artwork. Our job was to re-form the object, interpret the meaning of each symbol and make inferences as the nature of the culture that had produced it. We then presented our conclusions to our fellow archeologists. As I sat there, listening in-role, nodding and muttering as my classmates in role, re-interpreted, or miss-interpreted, the works we, as “artists” had created, I was both amused and intrigued. Questions about history, personal legacies and the passage of time started running through my head. There was a charged silence in the class as she finished. The words seemed to hang in the air. We didn’t have to talk about the poem to “understand” it. Through the process of drama in education we had “lived” it, and our experience made that poem resonate for me in a way unlike any of the word-by-word dissections I had experienced in my undergraduate studies. I began to imagine what it might be like to be a teacher who could bring that kind of experience – that blending of the emotional and intellectual worlds of education and theatre – into the classroom on a daily basis. 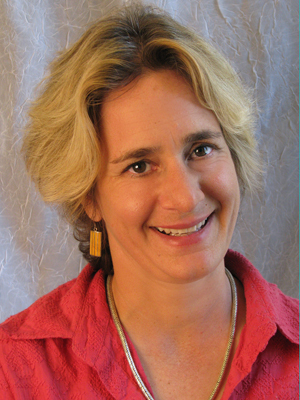 In the two decades since my experience in Nancy’s class, I have moved from student to practitioner to program director. I’ve worked with thousands of teachers and students across the five boroughs, the country and the world exploring how the power of theatre can support social, emotional and intellectual growth. Most recently I found myself in our nation’s capital attending the annual conference of the National Association of Education for Young Children, where our friends from Wolf Trap (VA), were presenting the Key Note on their groundbreaking work, STEM (Science, Technology, Engineering and Math) Through the Arts. 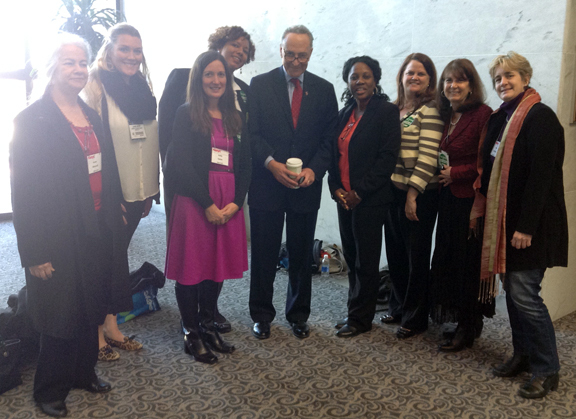 While in D.C, I joined fellow educators and administrators from Brooklyn, Chatauqua, Climax, and Walton, New York to meet with members of Senator Gillibrand and Schumer’s offices in order to advocate for Strong Start for America’s Children Act. We were fortunate enough to grab a moment with Senator Schumer (coffee in hand) and talk early childhood education and bicycling in the City. Helen, on the far right, with Senator Schumer, center. 20 years ago I was hooked by the power of educational theatre.